Kinkaku-ji "Golden Pavilion", formally known as Rokuon-ji "Deer Garden Temple", is a Zen Buddhist Temple and the most popular tourist attraction in Kyoto. 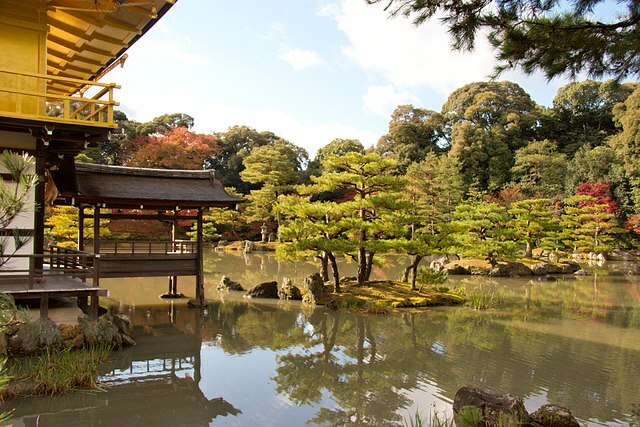 The site of Kinkaku-ji was originally a villa, belonging to a powerful statesman "Saionji Kintsune". Kinkaku-ji's history dates to 1397, when the villa was purchased from the Saionji family by "Shogun Ashikaga Yoshimitsu", and transformed into the Kinkaku-ji complex. 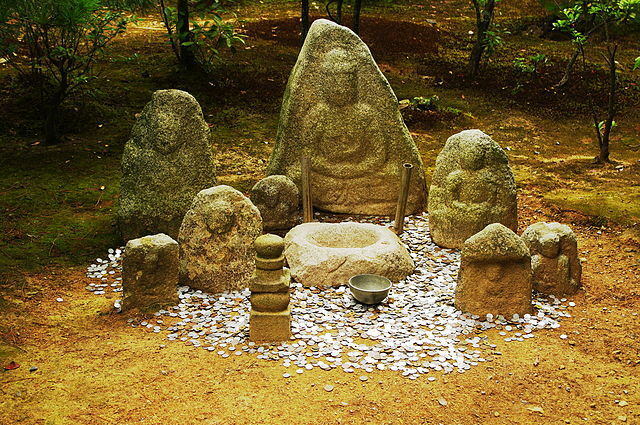 When Yoshimitsu died, the building was converted into a Zen Temple by his son, according to his wishes. Kinkaku-ji was the inspiration for the similarly named Ginkaku-ji "Silver Pavilion", built by Yoshimitsu's grandson, Ashikaga Yoshimasa, on the other side of the city a few decades later. The pavilion is three stories high and approximately 12.5 meters in height. 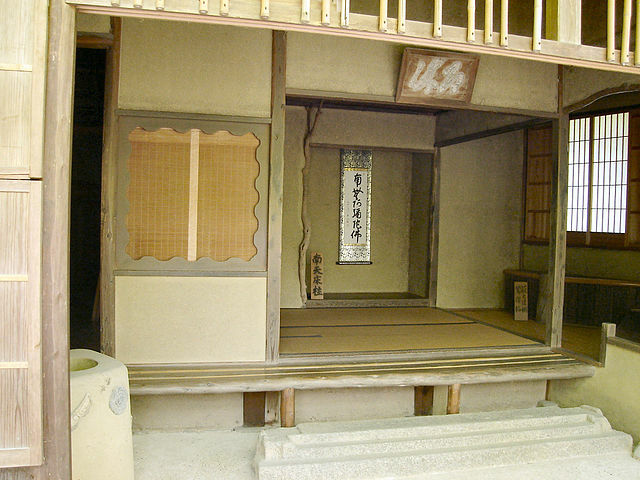 Each floor represents a different style of architecture which are shinden "first floor", samurai "second floor", and zen "third floor". 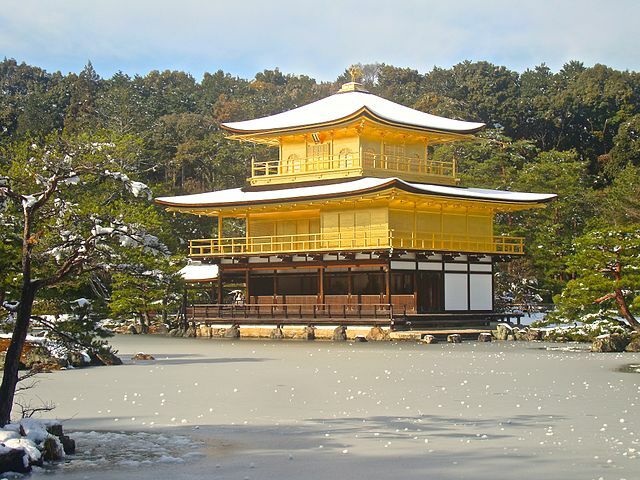 The name Kinkaku is derived from the gold leaf that the top two floors of the pavilion are covered in. It is gilded with 20kg gold leaf. The building extends over a pond, called Kyoko-chi "Mirror Pond", that reflects the building. With the focus on the Golden Pavilion, how the structure is mainly covered in that material, creates an impression that stands out because of the sunlight reflecting and the effect the reflection creates on the pond. ​There are also the Sekkatei Teahouse, souvenir shops, a small tea garden where you can have matcha tea and sweets, and Fudo Hall, a small temple hall which houses a statue of Fudo Myoo, one of the Five Wisdom Kings and protector of Buddhism. The beautiful landscaping and the reflection of the temple on the face of the water make for a striking sight, but keeping the mobs of visitors out of your photos will be a stern test for your framing abilities. 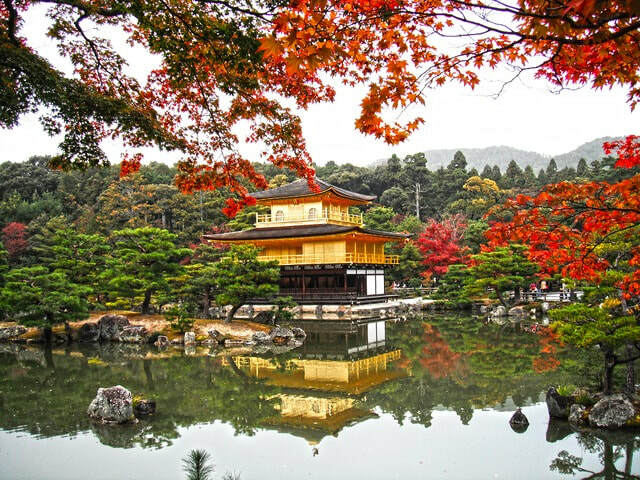 Kinkaku-ji is one of the most popular buildings in Japan, attracting a large number of visitors annually. ​If you would like to enjoy it without the crowds avoid the holidays and go early on a weekday morning or enter right before closing. From Kyoto Station by direct City Bus number 205 or Raku Bus number 101 to Kinkakuji Mae bus stop "takes about 35 minutes". 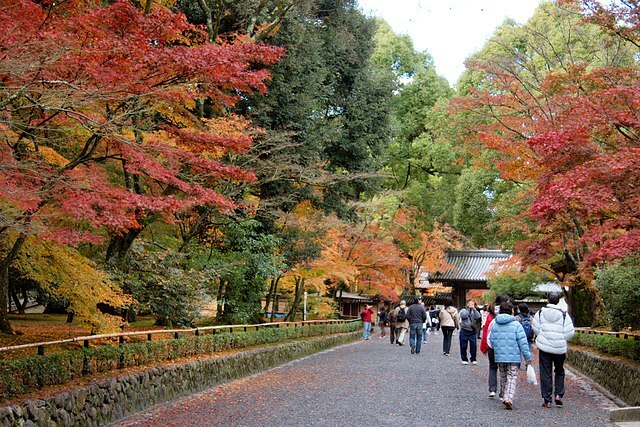 Visiting the vast temple complexes of North-Western Kyoto can take the better part of a day. A suggested itinerary is to take the Subway Karasuma Line to Kitaoji Station, and walk west along Kitaoji-dori. Daitoku-ji, Kinkaku-ji, Ryoan-ji and Ninna-ji Temples are all on Kitaoji-dori, and about 15-30 minutes' walk apart. However, if it is summer time and sweltering hot it is easy to take the bus from temple to temple as well, just read the route map at the bus stops.